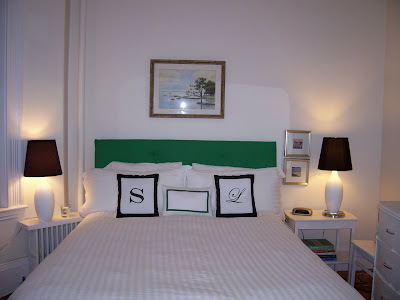 I painted the lamps white, made the two pillows with our initials and trimmed them in black grosgrain ribbon, and changed the bedding to plain white. 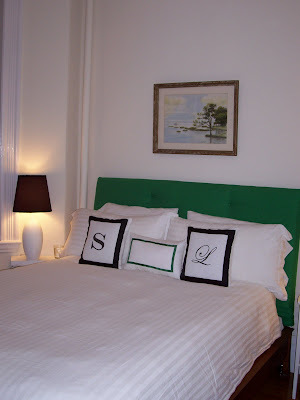 *More buttons will be added to the headboard, they were ordered online but had not yet arrived when I took these pics. I do like the idea of zebra pillows as Erin from Elements of Style suggested, so I'm on the lookout for some- but to add black to the bed I made the initial ones for now. I'd also like a nice cashmere throw for the end of the bed- I'm thinking a bright orange. I'd like to thank Kay and Erin for posting both inspiration pictures- keep the good ideas coming, because who knows what I will fall in love with next! How did you make the pillowcases? Recently I've been thinking about attempting to make pillowcases, but I'm a little intimidated! Yours look great! fab! I would add a little zebra too! Aw Kay, I'm so glad you like it!! I owe it all to you for getting me started with that first picture. Ooh! It looks fantastic. I love the pillows. I am on the hunt for a very specific pillow for my couch and I am afraid I may just have to make it myself since I can't find it anywhere. I can't sew, but you have inspired me!